A sad day, at least for me. This is my last Ask Gordon article. 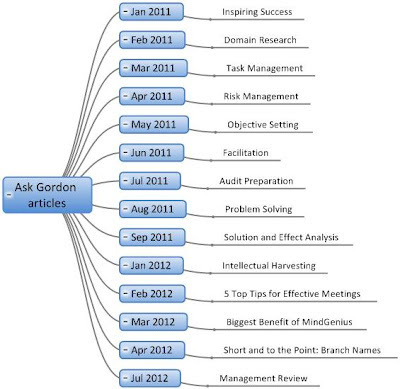 Back in January 2011 I started to write Ask Gordon articles and in that time we've covered quite a variety of subjects. It was an interesting challenge to communicate to others the different types of activities MindGenius helped me perform. It has been an interesting journey writing these articles, made all the more enjoyable by being able to use MindGenius to create them. It was also an eye opener for me as I began to realise just how much MindGenius has become an essential part of my life, both business and personal. It is now second nature for me to use it. I do it automatically without thinking. It has become ingrained in how I do things. It's amazing how, using the very basics of MindGenius - just type and return, that you, your brain and the computer seem to connect and all your thoughts, including ones you didn't know you had, just flow out and get recorded. It totally eliminates any fear of a blank page. Your eyes feed your brain and it sets to work. Even if you don't have a clue what to say or do, a way forward usually emerges, and sooner rather than later. Of course MindGenius has lots of tools to help you make the most out of the thoughts and ideas that you have generated, but the value I cherish is the ability to record and make sense of my thoughts. I'm sure that you have guessed by now that I am a big fan of MindGenius. It does the business for me. However like most things in life, you only get out what you put in. It's the same with MindGenius. It will not generate the content, you will. But it makes the task so much simpler and enjoyable. You can take a horse to water, but you can't make them drink. People often need to see the benefits that they can get from using different approaches. They need a stimulus. I have tried to give you food for thought on different ways that you might apply MindGenius to a variety of tasks and challenges that you may face. If they have encouraged you to use MindGenius more and in different ways, then we have been successful and you have benefited. Biggest benefit of MindGenius This addressed the key benefit you get from MindGenius, how it stimulates your creativity and allows you to record your thoughts and ideas in a visible form, make sense of them and share them with others. Domain Research We live in the era of the information Revolution. The internet has given us access to immense amounts of information. So when you need to research, collate and understand information (and you will) then this article gives you an insight into how to do it. At the end of the August I retire to enjoy the fruits of my labours. Safe to say I have everything in hand. My retirement plan has been developed and implemented using MindGenius. But the map is for my eyes only! I will still be using MindGenius in my retirement, there are lots of things to do and plan. Perhaps I should write a book called "MindGenius for retirees"? I will also be joining the new Mind Mapping in Business Linkedin Group just to keep abreast of how people are using MindGenius and gain from the experience of others. You can still teach an old dog new tricks. MindGenius have launched a new group, Mind Mapping in Business, on the social network, Linkedin. This group is for professionals who are actively or considering using mind mapping software in business. We understand the importance of maintaining communication with our users and are constantly looking for more interactive ways to keep in touch. This group offers another opportunity for our users to submit feedback, share tips and provide success stories with other professionals who are focused on utilizing mind mapping software to improve productivity, internal & external communication and all other aspects of business. Join the Mind Mapping in Business group now. Catch up on articles including ‘7 tips on how to create the perfect project plan in project management’ here or ‘5 top tips for effective meetings’ here.